Andy H: AfterShock Comics are the new kids on the block as far as publishing is concerned but their creative stable is already nothing short of impressive. 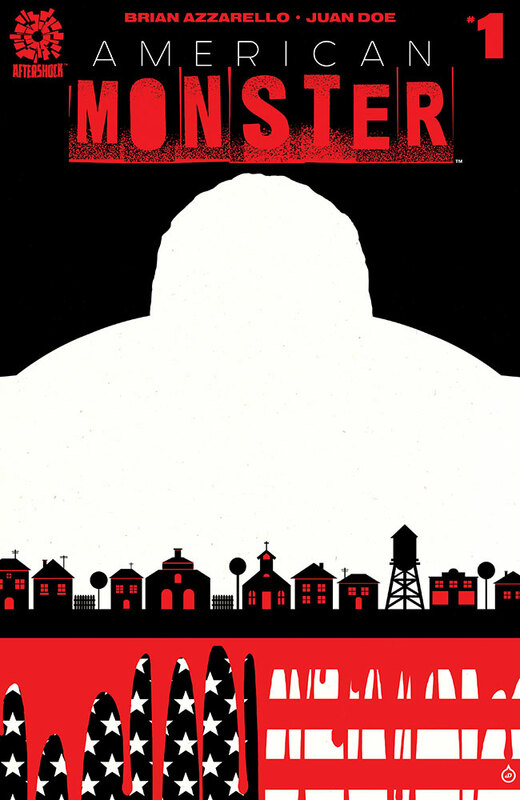 This week is the start of another new title from them, this time by writer Brian Azzarello and artist Juan Doe. One man arrives in a small Midwestern town and takes on the gang controlling it. Hailed a hero, the story then looks to take a turn as we see the real motive for this mystery man's actions. American Monster #1 could be ideal for fans of Southern Bastards, so that's me signed up then. That man Rick Remender is back again with a new miniseries, this time from Dynamite Entertainment. Devolution #1 sees mankind, in fact every living creature on the planet, devolved into a prehistoric state. Of course we need some heroes of the piece and it's up to them to see if there is a way to return the world to its natural state. The series features some cracking covers by the talented Jae Lee. Thanks to the medium of comics, certain TV series live on and continue to have great runs. One being Buffy, which is out this week, and another is Jim Henson's Storyteller. This title only appears now and again but is always worth a look. The last miniseries featured stories about witches, this time it's dragons. Single issue stories, beautifully told by different creative teams, make for a great read. Silver Surfer #1 is back, again! The creative team of Dan Slott and Mike Allred worked wonders on the last series and they're back for more, so if you enjoyed that it's definitely worth jumping back on board for this latest run. After exploring the universe, this #1 brings the Surfer and his companion, Dawn Greenwood, back to Earth. Now, it's a sad but true fact that I still haven't watched the Agent Carter TV series but I'm always hearing good things. So I will have to check out Captain Marvel #1 as it's written by Tara Butters and Michele Fazekas, producers of Agent Carter and writers of the excellent Reaper TV series (is it really eight years ago?). Finally, I need a dose of mayhem to finish my pull-list so it's over to Skottie Young and I Hate Fairyland #4. As ever, a fairly eclectic batch of comics to work my way through, but that's what makes it so much fun! Stewart R: It's quite a rarity for me to be picking up a Dynamite Entertainment comic - might it be all of those Alex Ross covers actually putting me off? - but here we are, a new year and Rick Remender releasing a comic for the publisher and grabbing my attention in the process. Devolution sends the human race in a downward spiral back to Neanderthal times, leaving only a few homo sapien types attempting to find an antidote to the virus that brought this all on. Remender likes to look at the human condition in each of his books so I cannot wait to see what facet of our existence he puts under his storytelling microscope with this five-part series! Another title to get excited about is the long awaited return of Nowhere Men over at Image. Issue #7 sees Eric Stephenson return to his 'rock star scientist' sci-fi series, this time having Dave Taylor come onboard for illustration duties alongside colourist Jordie Bellaire. I for one will definitely miss Nate Bellegarde's artwork on this book as he gave that first arc a truly distinctive style, but I understand that external issues may have led to a change being necessary and look forward to seeing what Taylor can produce. Things were left incredibly open-ended at the end of the previous arc and it'll be interesting if this turns into something of a super-powered team book or remains something quite different. On the second issue front I'll be picking up both Lucifer #2 from Vertigo and the lengthily titled Patsy Walker AKA Hellcat #2 from Marvel as both impressed with their debut efforts and all being well the respective creative teams will drum home the quality in the second and pile the delicious pressure onto my hefty pull-list!